Here in north Florida, it is not cold enough for some temperate fruits such as cherries and apricots. On the other hand, our winters are too cold for most tropical fruits like mangoes to produce fruits without the protection of a greenhouse. 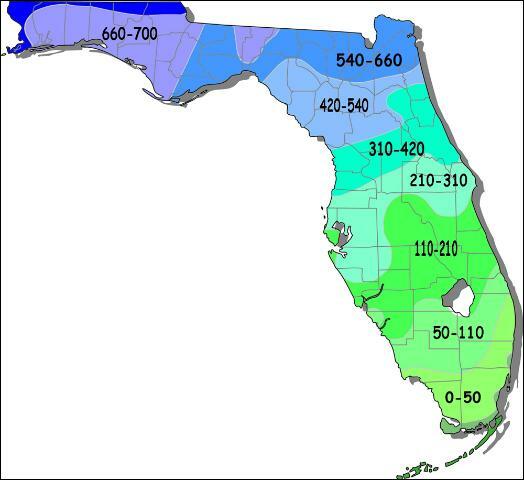 This map is courtesy of University of Florida, Institute of Food and Agricultural Sciences (UF/IFAS) Growing Plums in Florida. Chill hours refers to the approximate number of hours the temperature is between 32 degrees Fahrenheit and 45 degrees. This is usually measured between November 1 and February 15. Different varieties of plants require different amounts of chill hours before they will bloom. If you plant a variety with a chill hour requirement that is too low or too high, it will not flower at the right time and fruit production will be low. Here you will find the varieties that are the easiest and most reliable for our area. Many of these varieties are much tastier than the limited selection available in the supermarket. Most of these plants provide seasonal displays of showy flowers and foliage and can be easily integrated into an attractive home landscape. Select a topic below to learn how your garden can be tasteful as well as tasty with these useful plants.